Looking to maximize your existing beds comfort? Look no further than the Pacific Coast ® Gusseted Baffle Box Feather Bed. Many Marriott ® Hotels use this bed exclusively to give customers the ultimate in comfort and support. The Feather beds Baffle Box design eliminates the daily maintanence that many other featherbeds would require and will keep you from tossing and turning night after night. 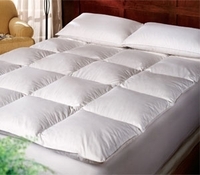 With sizes to fit any mattress give the Pacific Coast ® Gusseted Baffle Box Feather Bed a try and sleep better tonight!